Are you current on your mortgage? For many North Carolina homeowners, that answer is increasingly (and worryingly) no. Mortgage statistics provided by the state’s Office of the Comptroller of the Currency show that the percentage of mortgages 30-59 days late increased 10.4% in 3rd quarter 2012. Also in the third quarter, there was an uptick in foreclosures initiated, totaling 252,604 in the latest reported period (ending 9/2012). 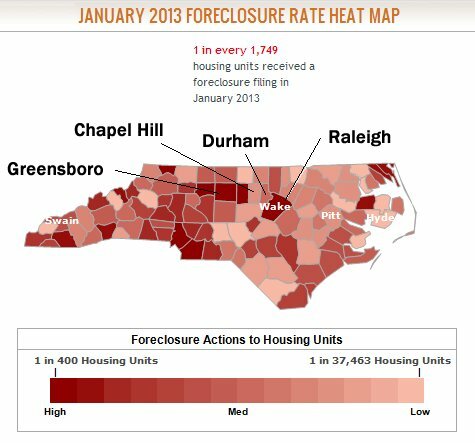 As shown on the diagram above, Raleigh was an area of increased foreclosures according to realtor data for January 2013. It may be advisable for these homeowners to consider bankruptcy attorneys. Raleigh NC is an area of alarming foreclosure activity where many consumers may be benefited by bankruptcy. 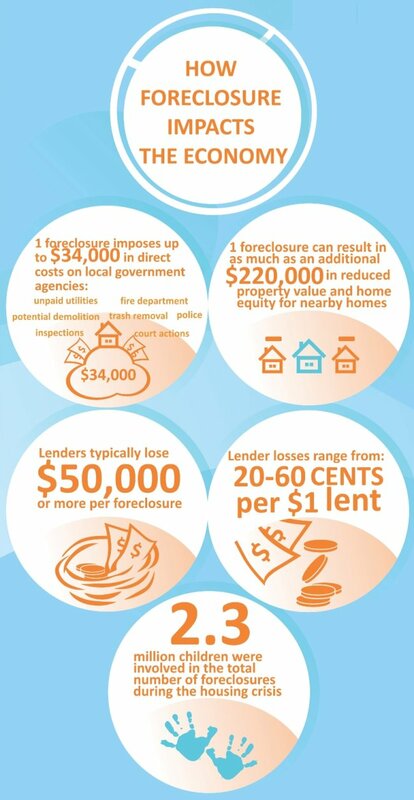 By January 2013, one in every 1,749 homes in North Carolina was in foreclosure. If your mortgage is one of those falling further and further behind, you could be headed to foreclosure as well. You may already be receiving threatening letters from your lender promising that fate if you don’t get current. If this is your predicament, a timely bankruptcy filing with the help of a reputable North Carolina bankruptcy attorney could actually save your home. Another city where defaulting homeowners may need a bankruptcy lawyer: Greensboro NC. This area is also a hot spot you can see on the January foreclosure graphic above! I wrote recently about some of the little understood truths about bankruptcy. One of these is that filing bankruptcy may be your best alternative to keep your home if you are struggling financially. The two types of personal bankruptcy – Chapter 7 or Chapter 13 - offer different benefits to homeowners. If the reason you are unable to make timely mortgage payments is a ton of other debt – credit card debt, medical bills, personal loans and more – Chapter 7 may be preferable. You’ll need to get your lender’s consent to keep your home under a Chapter 7, but with the housing market in many North Carolina cities still abysmal, they may be willing to work with you. Once you unload all of the other debt that’s dragging you down, you may be better able to meet your mortgage obligations. If you are further behind and your mortgage is the lion’s share of your debt load, a Chapter 13 may enable you to get on a plan to get you back on track. Your mortgage company may even work with you to adjust your interest rate to help you regain your financial footing. Most lenders really don’t want to foreclose on and repossess your home. It’s a huge hassle to them and unless the housing market picks up, they likely won’t regain on a sale what they’ll get from you under your current repayment plan. Most homeowners bought before the real estate bubble burst and are paying on homes valued far above what they currently would be assessed at. Rather than something to be feared, bankruptcy laws may offer protection for you and your home depending on your circumstances. Rather than wait for the boom to drop, why not contact a reputable bankruptcy attorney? Raleigh, Durham and Greensboro consumers in mortgage arrears may benefit in particular from bankruptcy protection.